Loko Natyadal (Shidweshari) will stage its much acclaimed production Sonai Madhab at the Experimental Theatre Hall of Bangladesh Shilpakala Academy in the capital on Tuesday evening. Srishti Cultural Centre has arranged the four-day dance drama festival. 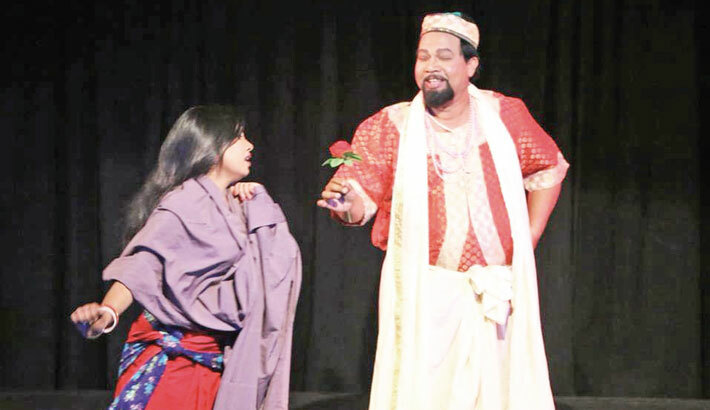 Sonai Madhab weaves a tale of romantic tragedy between Sonai and Madhab, the leading characters in the play, based on a story from Mymensingh Gitika - a rich collection of folk-ballades. The play, directed by Liaquat Ali Lucky, is a dramatic depiction that weaves woes, agonies and dilemmas of women in a traditional narrative way. Talking to media, Lucky said, “Sonai Madhab is mainly a merger of Padabali Keertan and Yatra. To make the production interesting, we have added a few traditional dance performances.” “But, it is noteworthy to mention here that all the female characters for the production have been played by men, a common aspect of ancient theatre in Bangladesh,” he added. The play is more a Pala rather than a theatrical production as it follows the Pachali way, a narrative style of ancient theatre. The audience can visualise the story in Pala form through traditional music and dance recitals. The play showcased an ancient and common theatre trait of Bangladesh on stage as male artistes played the female characters in the play. The cast of the play included Roksana Akter Rupsa, Zahidul Kabir, Liaquat AliLucky, Momen Mia, Shaila Ahmed, Mamun Hossain, Mahabub Tonoy, and Rowshan Hossain, among others.